by Erin Kanuckel, MUG Executive Director The weather is changing, the snow has melted, and people are outdoors soaking up the sunshine in celebration of spring. Phone calls are starting to pour into the Milwaukee Urban Gardens office from individuals, gardeners, and teachers who want to find land in the city to grow food. MUG receives phone calls from people who have never gardened before but are hoping to learn from a more experienced gardener at a community garden close to home. Others call because they have their eye on a vacant lot and their neighbors are ready to start digging as soon as the ground can be worked. Teachers are calling because their students want to plant a row for the hungry. Everywhere you look new gardens are sprouting up on vacant lots, in backyards, and on school grounds. In the current economic climate more people are gardening to conserve resources and save money on groceries by growing fresh fruits and veggies for their families. MUG supports individuals and community gardeners by offering resources and assistance to help groups and individuals get started. This spring they are offering Grow Your Own Groceries, a beginner level backyard gardening course that teaches urban residents how to design, plant, and care for a productive vegetable garden. Also, MUG is collaborating with Anna Young, a teacher-in-residence at the University of Wisconsin-Milwaukee, to create World Lunchbox, a K-8 curriculum specific to Milwaukee. It will integrate science, social studies and civic engagement into an urban gardening/farming atmosphere. World Lunchbox will meet Milwaukee Public Schools education standards. The pilot version will be ready in June, 2009. 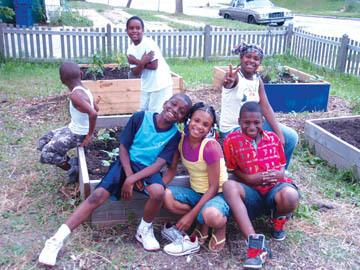 To learn more about Milwaukee Urban Gardens, the programs they provide, and how to get involved, please visit milwaukeeurbangardens.org or give us call at 414.431.1585.